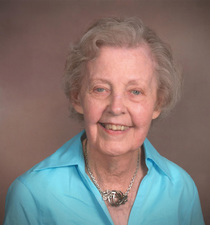 Beryl McHugh Poulton passed away in Columbus, Ohio at the age 96 on February 3rd, 2019. She was born January 5, 1923 on a cold snowy day in Monroe County, Ohio to Jim and Ina Waife (Cline) McHugh. Beryl was preceded in death by her husband of 55 years, Ralph Edwin Poulton and her parents; sisters Helen (Carl) McHugh Dye Drake, Ruby (Harry) McHugh Bauman, Mildred McHugh and brother Frank (Ruth) McHugh. Beryl is survived by her sister Marjorie McHugh Olson of Clermont Florida, devoted Wesley Glen friend Don Pendell; children Dennis (Kathy) of Dacula, Georgia; Jeff (Sharon) of Columbus, Ohio; Deanna (Steve) Butherus of Greeley, Colorado; Fred of Columbus, Ohio; grandchildren Erica (Bill) Halliday, Scott Poulton, Kendra Poulton, Cory Poulton, Sarah (Sean) Scribbick, Rachel Butherus, Danny Butherus; great-grandchildren Sadie and Macie Halliday, Cooper and Delaney Scribbick; five generations of nieces and nephews. Beryl grew up on a farm in Monroe County, Ohio. She was the fifth of six children and told many stories about life on the farm. Beryl received her early education in a one-room school and credits her mother for instilling a lifelong love of learning. Beryl graduated from Kent State University in 1942 with a degree in music education and taught high school for five years in Graysville, Ohio before marrying Ralph Poulton in 1948. She returned to teaching in 1970 for the Columbus Public Schools as an elementary teacher for another 12 years. Beryl and Ralph raised four children in Columbus, Ohio; Beryl ensured that all the children were well educated, had ample opportunities for music education and participated in church youth activities. All four children graduated from Whetstone High School. Ralph and Beryl attended twelve straight years of high school marching band programs. In her retirement years, Beryl enjoyed spending time at the Monroe County farm; visiting with her children and grandchildren, and continuing to pursue her church activities. She developed lasting friendships through her church life that remained very important in her spiritual life. Beryl lived her final years at the Wesley Glen retirement center and her life centered on activities there. Beryl always lived life in the present and frequently said that the best time of her life was “now”. A memorial service will be held in Columbus at North Broadway United Methodist Church on Saturday, February 9th at 1:00 pm. The family will greet visitors before the service from 11 am to 1 pm. Calling hours will be in Woodsfield, Ohio at the Bauer and Turner Funeral home on Sunday, February 10th from 12 pm to 2 pm, followed by burial at Oaklawn Cemetery. In lieu of flowers, contributions may be made to North Broadway United Methodist Church.